How to best prepare students for workplace changes brought on by automation and other technologies, however, is not yet clear among educators and labor experts. “Everywhere I look, the message is all about the impact of artificial intelligence and drones on the future of work,” said Nancy Hoffman, senior advisor and co-founder of the Pathways to Prosperity Network, which seeks to help prepare young people for the workforce. “School systems need to change, but they needed to change fifty years ago, too. Our schools are way behind in terms of technology and helping our young people understand the labor market and plan a career.” She and other workforce experts stressed that as educators try to equip young people for future jobs, they will have to move more quickly to connect the dots between high schools and the labor market, especially for disadvantaged students. I have an unpopular opinion on this topic: we will be chasing the cat's tail if we ask schools to prepare students for the specific jobs of the next generation. Job training is critical, but the K-12 system does not have a Magic 8-Ball for predicting the future of regional economies. There are some trends we can predict with a degree of reliability, but on the other hand, consider the fact that one of the world's most influential industries - social media - didn't even exist until the early 2000s. The K-12 system should not preoccupy itself with economic forecasting; it should prepare students to read, write, code, analyze, and calculate at the highest possible levels, while teaching foundational content that prepares students for a whole range of post-secondary and career opportunities. This radical new high school in Washington, D.C., is really two schools — two approaches — in one. It strives to teach students traditional subjects, including algebra and English, while also helping them grow socially and emotionally. But both efforts require valuable class time, and the school struggles to find a balance. In the second half of the school year, that struggle for balance reaches a crisis: Roughly 40 percent of the students are at risk of failing ninth grade. In response, Principal Ben Williams makes several big changes. He gives students more time in their core classes, including math. He creates a special, seven-week session of optional Saturday classes. Read - or listen to - the whole piece, because it contains a rigorous, real debate about the complexity of setting high academic standards. Spoiler alert: there are no clear cut answers. According to Oma Holloway, the much respected co-chair of Community Board 3, and the chair of the CB3 Education and Youth Committee, she was in the cafe with fellow CB 3 board member Michael Catlyn in the late afternoon awaiting their orders when two young African-American kids came in trick or treating. The merchant behind the counter told the two middle-schoolers that the store didn’t have any trick or treat candy so the kids politely left. A few minutes later, a young African-American mom came in with her two kids trick or treating and the barista again informed them they didn’t have any candy. Then two younger African-American girls came in trick or treating and they were also told the store did not participate in the holiday. Holloway said that finally a white mother came in with her two kids trick or treating and this time the barista took out a jar of candy from behind the counter and started doling out sweets to the kids. This cafe is about a mile from where I live, and it's on the same street as the restaurant that got caught using racist tropes as a marketing scheme earlier this year. The Bed-Stuy and Crown Heights neighborhoods have undergone rapid gentrification in the last ten years. Almost every resident has a story like this one, in which newer, wealthier, and usually Whiter residents do things that run the gamut from the culturally insensitive, to the outright racist. I don't doubt for a second that this story is true, because I've seen and heard far worse. Gentrification is one of the issues that I expect will come up during a community meeting in Bed-Stuy on Sunday evening. 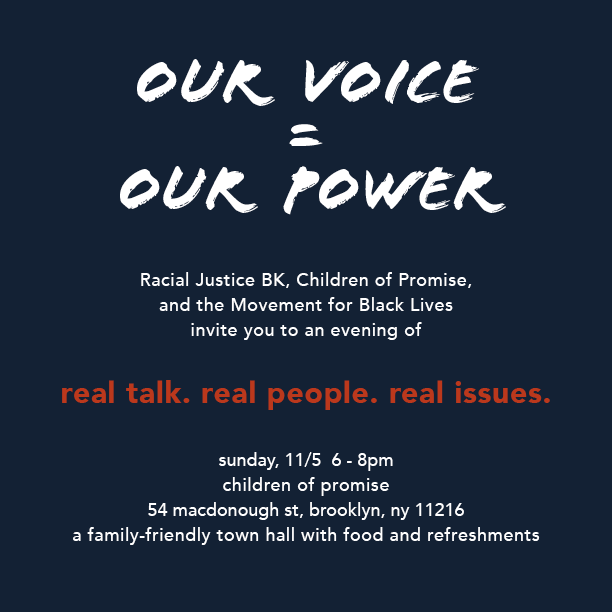 The event is being hosted by Racial Justice BK, in partnership with the Movement for Black Lives and Children of Promise. (Full Disclosure: I'm personally involved in organizing with Racial Justice BK.) If you're in the neighborhood and want to hear the perspectives and concerns of your neighbors, you should come.